Exploring the history beneath our feet, the NI Environment Agency's Archaeology Days for 2009 have just gotten underway, with (mostly free) events scheduled across Northern Ireland throughout the summer. "June sees the start of a summer long series of archaeological and historical events and festivities to celebrate National Archaeology Days. There are a wide variety of interesting and exciting events taking place at historical sites and monuments across Northern Ireland." Organised by Belfast City Council, tours will be led by Jim O’Neill and Ruairi O’Baoill. Starting at the City Hall, the tours will include insights into the archaeology and development of the city, historic buildings, exciting episodes and characters and anything else they think will be of interest. Wear sensible footwear. Contact the BCC Culture and Arts Section. 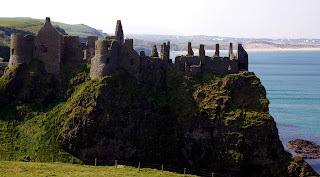 Elsewhere, there are tours of Carrickfergus and Dunluce Castle; a walk around the Armagh Observatory; Bangor and Holywood through the ages; visits to Fermanagh's castles; a public excavation at Bellaghy Bawn and in Strabane, minibus and walking tours of prehistoric sites.